This [Center of Southwest Studies] Occasional Paper no. 5 tells the history of a homestead now preserved as part of the Lindner family’s Weminuche Valley Ranch. 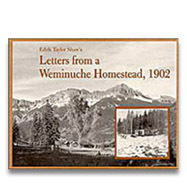 Through letters spanning April through December 1902, one pioneer wife recounts the challenges of life in the high country, culminating in a winter storm that brought three feet of snow and temperatures that reached 14 degrees below.